Jordan – Jerash, Ajlun, Amman. Day Two. One of my most favourite sounds is the Muslim call to prayer. There is nothing more magical and exciting to my ears than the sound of all the local mosque muezzin’s seemingly battling it out between each other over the loud speakers calling their faithful worshippers. 5am and I’m woken by the first call of the day. I wake up, smile, remember that I’m back in the Middle East and then fall asleep for a bit longer. After an arabic buffet breakfast our driver Omran picked us up for a full day of sightseeing which would take us north of Amman. Just over an hours drive away, the main stop of the day is Jerash – also known as the Pompeii of the East , referring more to its preservation and vastness as it was not covered in volcanic ash as the original Pompeii tragically was. However, before exploring the Roman ruins we drove onwards to Ajlun Castle, which is just a short drive from Jerash. The castle is set up on top of a mountain and dates back to AD1135, originally built to protect them from Crusader attacks. Dad was certainly excited for his first castle visit. It only takes about 30 minutes to look around and the views across the land are worth it. Back down the mountain and we pull up into the car park for the entrance to the Roman ruins. There, directly in front of us is the Arch of Hadrian. A huge, imposing, well preserved arch which was built in honour of the Emperor Hadrian way back when in 130 AD! Now, I was never very good at history, or writing about historical facts. My Dad is a wealth of knowledge about these things so whilst they suggest you hire a local guide from the entrance to take you around we were confident enough that Dad could entertain me with some “fun facts” and the Lonely Planet guide would guide us through the rest. There is a Roman Army and Chariot Experience performed twice a day, where they put on a theatrical show showing you how it was back in the day. Unfortunately as it was Friday, there was only one show in the morning at 10am and we had missed it. To be honest, we weren’t that upset missing the show despite reading all the “must do” reviews. So, without wanting to bore you too much I shall leave all the descriptions and history lesson on Jerash to the ever informative Jordan Tourism Board. Omran was also hired for the coming week by a Canadian couple who were on a 4 month travelling trip. Omran has a team of drivers and as we were wanting to do the same activities on the same day we travelled in convoy. The meeting spot after exploring the ruins was back in the middle of the small market place by the entrance. What fun we had drinking tea with the local shop owners, dressing up in keffiyeh’s – the traditional Jordanian headdress and taking photos. Dad was offered 500 camels for me by Muhammed, one of the young guys working in the shop. His Uncle offered 1,000. Much better rate than Morocco when my travelling companions were offered 2 camels for me! Haha. A popular souvenir in Jordan is a sand art bottle. The bottles are filled with naturally coloured sand and illustrated with scenes of camels, mountains and desert dunes by using a small wire to push the sand into these images. Our names were also illustrated in the bottles using sand. What a wonderful keep sake to be given! Omran took the four of us to a wonderful restaurant at the top of the hill in Jerash. It is quite popular in higher end restaurants and hotels for breakfast, lunch and dinner to be in a buffet style. This is such a great way to be able to experience all kinds of local foods and as I am vegetarian there is always a wonderful meat free spread. I must also add that the deserts are always divine (and buffet style too……) it would be rude to not try a few of them too. We also got to sample our first Jordanian beer. We chose Philadelphia beer for our first taste. However we were recommended to drink “Amstel” as it was a “local” beer. I wasn’t sure how “local” a beer from Amsterdam could be but it turns out that Jordan was the first country to have a subsidary of Amstel set up outside of Amsterdam and has been brewing locally in Jordan – surprisingly since 1958! We headed back to Amman via an olive oil pressing factory. Olives are very much in season at the moment and we frequently passed families selling boxes and boxes of olives at the side of the road. Olive oil is a key ingredient to alot of arabic cooking so once it is in season it’s often popular to buy huge containers of oil to keep them going for a whole year. Once olives are out of season the prices for oil sky rockets. When we arrived back in Amman, Omran stopped to buy us a cup of sage tea which we sipped whilst we drove through the streets of downtown, passing the souks and stopping to take the obligatory touristy photos of the amphitheatre and citadel as the sun went down. In the evening we headed out with Omran and our new Canadian friends for a taste of a Friday night out Jordanian style. Omran took us to a wonderful sweet shop where we got to try a traditional Arabic desert – Kanafeh. This is warmed cheese like pastry coated in a sugary honey like liquid and topped with grated pistachios. I would never have thought that a dish with this combination of ingredients would taste so delicious!! Our next stop was Cantina Restaurant and Cafe. This is a popular hangout for groups of young people to smoke shisha on the weekend. Dad and I are very much non smokers but enjoyed soaking in the atmosphere, chatting with our new Canadian friends and Omran, plus the Newcastle v Tottenham match was showing on the flat screen tvs so that was a bonus for Dad! We arrived back at our hotel about 10pm after a wonderful, fun packed day and I was slightly relieved that the night market had finished ensuring a decent nights sleep before our long road trip to Petra the next day. 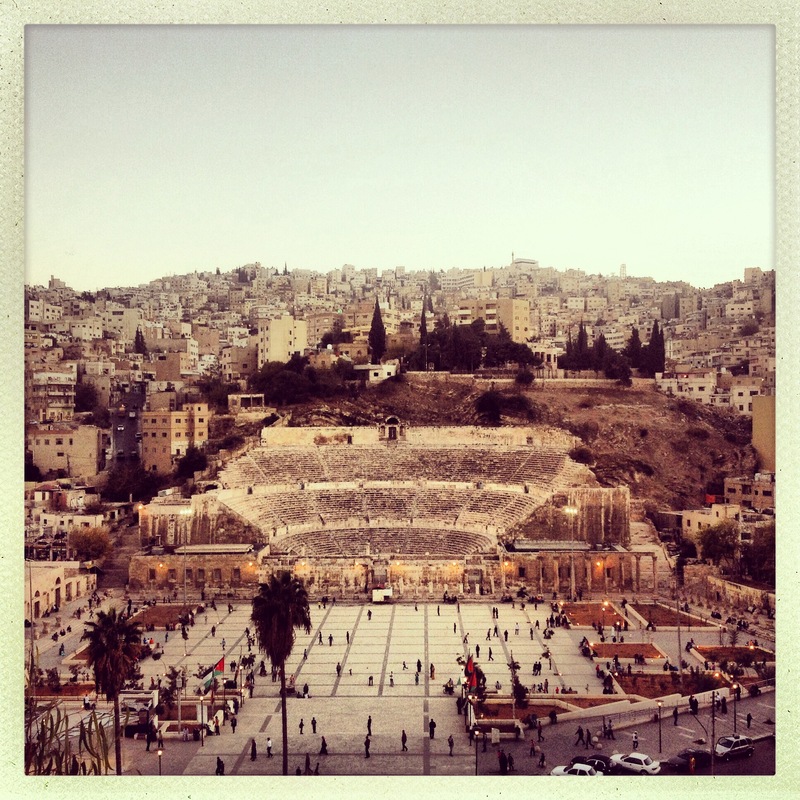 ← Jordan – Amman. Day One.